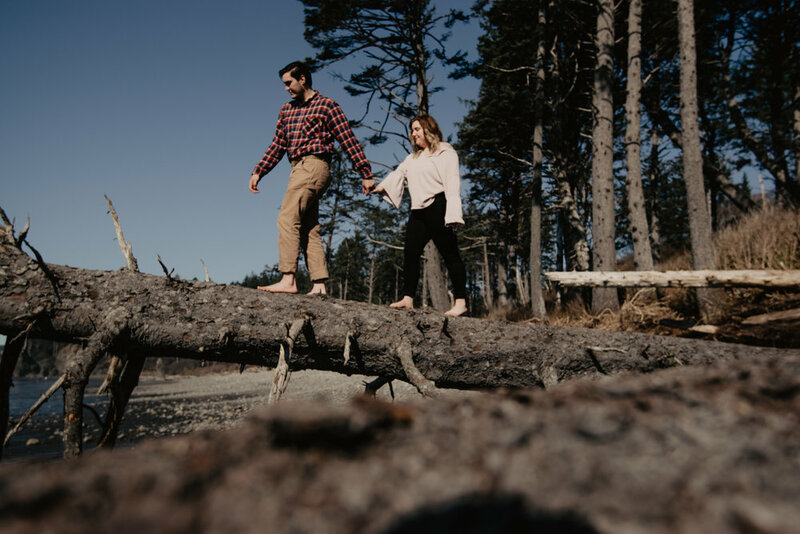 So of course I had to take full advantage of me finally getting to explore two of the beaches on my never ending "beaches I need to see" list and I got to do a sun filled couples session of Lauren and Will at Ruby Beach. Full daylight still scares me as I'm such a fan of blue hour, but I ran into head on and captured some of the most amazing sun flares to date - and I love my sun flares! These two cuties were so much fun, and I loved watching them loosen up and fully enjoy themselves too! They were such a prime example of why I love what I do...I love to capture my clients stories and moments, finding their joy and their peace all in a location that embodies them or that means something to them. I cannot wait to go back to this magical PNW rain forest, but for now I'm so grateful for the challenge of full on sun (I mean how much more blessed could I be with sunshine on the PNW coastline in the spring?!?) and for a couple who was so wonderful and open to getting their toes sandy and having fun.